J Biol Chem, 2016, 291(4):1538-51.. Semagacestat (LY450139) purchased from Selleck. HEK/APPswe cells were either left non-treated (-) or exposed to the γ-secretase inhibitor (GSI) semagacestat (+) for 19 h prior to cell harvesting and membrane preparation (Substrate accumulation). Exposure of cells with GSI prior to membrane preparation results in higher Aβ1-42 and Aβx-42 signals as compared to membranes derived from non-GSI treated cells. Direct addition of semagacestat to the membranes in the novo Aβ production assay inhibited Aβ production (Semagacestat (1 µM)). The amount of Aβx-42 is higher than Aβ1-42 suggesting that C83 is the major substrate for the Aβ42 signal detected. J Biol Chem 2014 289(3), 1540-50. Semagacestat (LY450139) purchased from Selleck. None of the AZ GSMs (square, triangle, and ×) or E2012 (O) affect Notch processing, whereas the GSIs L685458, DBZ, MRK-560, and Semagacestat do, as measured by quantifying the amount of nuclearly trans- located NICD in HEK293 cells stably transfected with △ENotch using immunocytochemistry. % NICD translocation is set relative to 0.5% DMSO (100%) and 0.5 μM L685458(0%)controls(mean±S.E., n＝2). J Biol Chem 2012 287(15), 11810-9. Semagacestat (LY450139) purchased from Selleck. 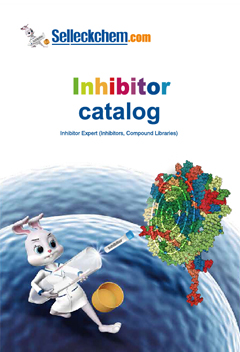 The best characterized γ-secretase inhibitor that has reached the clinic. H4 human glioma cells stably overexpressing human wild-type APP695 are treated with Semagacestat at various concentrations for 24 hours. Levels of Aβ42, Aβ40, and Aβ38 in the media are measured using separate ELISA kits. The expression vector of the constitutively active form of Notch (NotchΔE), encoding bases 1-60 and 5193-6657 of the human Notch1 coding region (NM_017617), is constructed into a pcDNA3.1 vector with a sequence modification from mouse to human. Notch signaling activity is evaluated using Cignal RBP-Jk Reporter Assay kit. RBP-Jk protein [CSL/CBF1/Su(H)/Lag1] is a transcription factor activated with Notch intracellular domain produced by γ-secretase. H4 cells are transiently transfected with the human NotchΔE expression vector and the RBP-Jk-responsive luciferase construct using Lipofectamine 2000, and then exposed to various concentrations of Semagacestat for 16 hours. Notch signaling is measured based on luciferase activity in the cell lysate using the Dual-Glo Luciferase Assay System. Method: Cells are incubated with Semagacestat for 24 hours. For detection of cell viability, the percentage of viable cells is quantified by their capacity to reduce 3-(4,5-dimethylthiazole-2-yl)-2,5-diphenyl tetrazolium bromide (MTT) following incubation with 0.5 mg/mL MTT for 60 minutes. For the detection of sAPP species, cells are lysed and analysed by western blotting. Formulation: Dissolved in 0.5% methyl cellulose. Mitani Y, et al. J Neurosci, 2012, 32(6), 2037-2050. Elvang AB, et al. J Neurochem, 2009, 110(5), 1377-1387. MK-0752 : Aβ40-selective, IC50=5 nM. 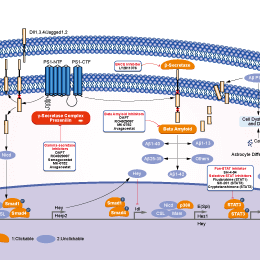 Avagacestat (BMS-708163) : Phase II for Alzheimer's Disease.